In March 1988 Sri Chinmoy (1931-2007) played on the famous pipe organ in the The St. Bravo Church (Grote Kerk) in Haarlem, Holland. This is Sri Chinmoy’s 32nd organ performance. The St. Bravo Church has one of then world’s most historically important pipe organs. Construction of the church was begun in 1307, and its first pipe organ was installed in 1630 by Galtus and Germer van Hagerbeer. The present instrument was the world’s largest when Christian Muller of Amsterdam built it in 1738. This organ was considered the most complex man-made device known, and was already a tourist attraction when it was new. George Frederic Handel was charmed by its vox humana setting that imitated the human voice; Felix Mendelssohn played on it, and in 1766 the 10-year old Mozart created a stir when he performed on it. A local story tells that the organ’s thunderous sounds have loosened the church’s foundation stones. The organ was modified numerous times, most notably by Marcussen & Son in 1961, and despite its 275-year history, ninety percent of its 5,000 original pieces are still in use. Video complied by kedarvideo, Switzerland. Browsing through my video archive I found these excerpts from a Peace Concert in Florence, Italy , from March 1988. Filmed and edited by kedarvideo. 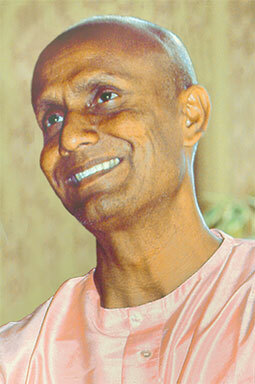 During a Christmas vacation in Suva, Fiji, in 1994, Sri Chinmoy gave a peace concert. These are some excerpts. Filmed by kedarvideo. On August 30, 1992, Sri Chinmoy meditated for almost an hour while the New York Bhajan Singers performed on his “Aspiration-Ground” in Jamaica, Queens, NY. Length: 46:23 min; filmed and edited by kedarvideo, Switzerland. Ashrita Furman holder of the most Guinness Records at the same time (currently over 200) and a team of friends created the world’s largest tennis ball logo within 7 days. The ball composition shows the logo of the Sri Chinmoy Oneness-Home Peace Run, the world’s longest and largest relay run for peace, and has a width of 10.08 metre and a height of 5.30 metre. The sixty-three-year-old health food store manager of New York set this Guinness World Record to honour the 87th birth anniversary of Sri Chinmoy an Indian spiritual master, founder of the Peace Run and an avid tennis player. The 53.42 square metre ball logo consists of 12,393 tennis balls in the colours white, blue, green, orange and red.